Very common in gun shop discussions, shooting magazines and books, as well as on the Internet are incessant discussions on “which caliber is the best”. Also included will be questions and opinions on which load leads the pack for a given caliber. Some walk with extreme confidence as they have the latest version of this or that handgun and it’s loaded with “nuclear” ammunition. Besides, whatever “expert” they subscribe to has proclaimed that this combination is “best”, citing gelatin testing or whatever. Others look up “street stats” on how well or poorly a certain caliber/load has worked. Some simply trust the gun shop person’s decision on ammunition selection and walk out secure in the “fact” that they are now capable of protecting themselves with the “best’ ammunition money can buy. This .44 Special Corbon expanded nicely using a Hornady 180-gr. XTP. It is not so aggressive an expander as some JHP bullets. Corbon no longer uses this bullet. Some people equate “stopping power” or their pet caliber’s effectiveness solely with expansion measurements. Is this the only factor to consider? Is this bullet actually less effective than one that expands to a wider diameter? Maybeunder some circumstances, but perhaps not in others. Some have concerns about serious lack of penetration. Opinions vary as to how much is enough. Some subscribe to the “two holes is better than one” theory and go with the deepest penetrators they can find, often .45 ball. Others want expansion but at least (10, 12, 14″, pick a number) of penetration. Very heated debates occur over such differences of opinion. Here are my thoughts on the matter and I claim zero status as any kind of “expert”. Neither am I a physician or pathologist. I am a shooter and a hunter. Take it for what it’s worth and then you decide if there’s any merit in what follows. It is a concern, but one that is overrated in my view. So many shots fired in gunfights completely miss the intended recipients that I believe getting the hits in the first place should take higher priority. With FMJ or non-expanding loads, there certainly is the possibility of a bullet creating a through-and-through wound and possessing enough residual velocity to injure or kill another person. With most JHP’s or expanding loads, should the target’s torso actually be completely penetrated, the expanded bullet will have lost considerable speed. It will probably be less dangerous, but the heavy magnums like .41 and .44 could be exceptions. It is not unusual for pathologists to find expanded bullets inside the clothing near the exit wound when preparing the body for autopsy. In his book, Gunshot Wounds, Dr. Vincent J.M. Di Maio reports that a 38-caliber LRN bullet requires at least 191 ft/sec to penetrate skin. He finds that the same bullet needs an average velocity of 280 ft/sec to penetrate two layers of skin and 6″ of muscle as this is the average velocity lost when such penetration’s occurred during testing. It seems reasonable that if we’re firing a 9mm, .38, or .357 expanding bullet that doesn’t expand, but still has around 300 ft/sec or so upon exiting the felon’s torso, it is possible for it to injure an innocent bystander. In the field, I witnessed a friend shooting a 35-lb. javelina with 230-gr. .45 ACP Ranger SXT from a 5″ 1911. At his shot, the animal collapsed and sand flew behind it. Another buddy and I found the fully expanded bullet lying on top of the sand. This animal was shot broadside and is not as thick as an average adult human male. I’ve no doubt that had the expanded forty-five smacked another person that it would have raised a whelp, but I do not believe it would have injured anyone. Believe it or not, the bullet traveled along the inside of his ribcage and did not damage anything vital! At the scene neither he nor I knew that and it was a pretty tense time waiting on the ambulance! I have no idea what residual velocity the 95-gr. bullet retained, but I’ll bet it was not much. Upon being shot, he returned a shot from his 9mm Hi Power, but missed the felon! Which bullet was more dangerous to other folks in the area? Obviously, the round that missed its intended target was. It certainly remains possible that over-penetration can occur, but with expanding ammo I’m not sure how likely it is to be capable of inflicting serious bodily injury. Again, the FMJ or solid bullets will almost certainly be the worst offenders in this regard. Gunscribe, Massad Ayoob, once wrote that about seven out of ten .45 ACP 230-gr. FMJ bullets exit the average adult male torso. I suspect that 9mm FMJ in 115 to 124-gr. exits more often. 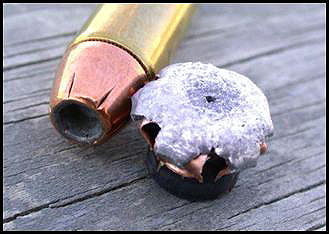 If an expanding bullet fails to fully mushroom, it should be slowed down and present less threat of over- penetration. Di Maio notes that in penetrating two layers of skin and 6″ of muscle, the 158-gr. LRN bullet lost velocity in the range of 214 to 337 ft/sec. The same weight/caliber SJHP lost 264 to 335 ft/sec. (Gunshot Wounds. Di Maio. Elsevier Science Publishing Company. P215.) He attributes this to the blunter shape of the expanding bullet when expansion does not occur. Misses are more dangerous to innocent bystanders than over-penetration in my view. I believe that we’d see better “stops” with better placement and present less danger to those around us at the same time. If you use .41 or .44 Magnum, I do think the chance of dangerous over penetration exists as quite a few of the expanding bullets are designed for deeper penetration for hunting applications. I’d look at defense loads from Corbon or Winchester’s Silvertip JHP’s in these calibers. I understand that Speer has just introduced a Gold Dot hollow point for the forty-one, but have no information on how it penetrates. It frequently does not expand. It will probably completely penetrate a human torso. It has been said that we want expansion but we need penetration. I believe this. The rhubarb seems to be over what is “adequate.” At the same time, I do not believe that loads failing to achieve whatever is deemed adequate are necessarily inadequate or doomed to failure. Opinions range from 9 to 10″ to the more popular view of 12 to 14″. Some want no less than 16″. Let’s take a look at this issue. This 9mm Corbon 115-gr. JHP +P routinely penetrates approximately 9 to 10″ in 10% ballistic gelatin. It is deemed a “failure” by some in the “stopping power” community. Is it? Others report it as an effective round with better street results than others which penetrate considerably deeper. Who is right? The mandate for deeper penetration stems from those believing that the only damage done by a handgun bullet comes from the permanent crush cavity. In other words, the bullet damages only that which it contacts. They cite that at velocities below about 2000 ft/sec, the temporary stretch cavity’s creation is neither violent nor large enough to cause any significant damage. The 147-gr. 9mm Gold Dot on the left would be favored over the 115-gr. +P JHP shown on the right. The heavier bullet creates a smaller temporary cavity and expanded to smaller diameter than the faster 115-gr. It also penetrates deeper. Which is best? One penetrates more deeply, but produces smaller overall diameter. This results in a smaller diameter crush cavity. My personal preference is for ammunition that expands and penetrates approximately 12 to 14″ in 10% ballistic gelatin. Having used such ammunition in hunting, I’ve seen pretty consistent results and made clean one-shot kills. Certainly the shooting of various wild animals does not correlate exactly with defensive handgun use, but I believe there is some correlation. I do not believe that the mechanism of collapse in a living, non-homogeneous, organism can be entirely predicted in the laboratory using gelatin. At the same time, the collection of data on what has or has not “worked” is not the full answer, either. The reason is that we cannot ascertain how many of the “one shot stops” were for psychological vs. physical reasons. Did the bad guy stop because he had to or because he wanted to? Ammunition penetrating less than 12″ is probably quite effective when shooting aggressors head-on and when no intermediate barriers exist. It might not be so effective if one’s required to shoot his opponent from the side where an arm is likely to be hit and more penetration’s required to get to vitals like the heart or aorta. I settled on the 12 to 14″ range as I think this is the better compromise between a load that might penetrate too little vs. one that regularly punches 16″ and probably exit the average human torso. Were I extremely concerned with over-penetration issues, I’d pick a rapidly expanding JHP that does 9 to 11″ rather than some of the pre-fragmented bullets. Bullets penetrating 12 to 14″ should suffice in most scenarios whether shooting is face-to-face or from more oblique angles without excessive penetration. I am willing to accept a bit smaller expanded bullet diameter to achieve this. I think this is where we go astray; we expect way too much from our handguns. Hunters have known that seemingly equivalent shots on similar animals can produce very differing results. One may instantly drop while the other runs, yet both received lethal hits to the heart/lung area. This is so often seen that’s it’s accepted. 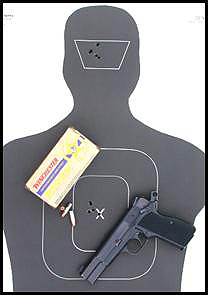 Deadly force scenarios for most of us are much rarer and there are folks interested in self-protection that have no experience in hunting; they have never seen anything shot. They have never seen a deer with a shredded heart run a hundred yards. They have seen shoot-em’-ups on television and movies. Many of us do not have the proper “respect” for what adrenaline can do and most have not witnessed the damage a person on PCP can withstand and just keep going! I believe it’s an unrealistic expectation to assume that any defensive pistol cartridge will deck a human being as though struck by lightning. It will happen on some occasions, but not all and probably not the majority. 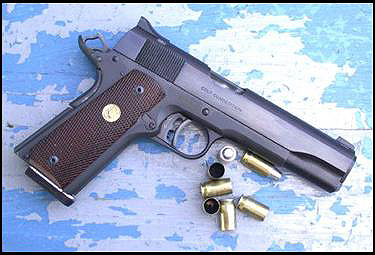 Many consider the .45 ACP 1911 a premier defensive handgun. I sure do, but only if one can shoot it accurately. This requires practice. There is truth in the statement that a hit with a .22 is better than a miss with a .44! If you don’t shoot the .45 as well as another caliber or if you don’t feel comfortable in carrying cocked-and-locked, a different caliber and action are legitimately called for. The high-velocity rifle bullet doesn’t always stop the game animal even with good hits, but normally the animal will not run as far before dying as when hit with an arrow. Even though hemorrhaging severely, they can go surprising distances if too quickly pursued. Adrenaline and the will to live push them beyond what many consider possible. In a life-and-death struggle, seconds seem like hours. The good guy has been forced to shoot the felon, but nothing happens despite a good hit. He shoots again and again and again and finally the bad guy drops. The actual time frame may have been but a few seconds, yet to our survivor, his handgun/load seemed not up to the job. None of them are in my opinion. Some are better than others, but none smite like the Hammer of Thor and it’s simply not realistic to expect it. It could also be dangerous. Expect a failure and be mentally prepared to deal with it. Expect that multiple shots may be necessary to actually stop a determined aggressor. Easy to say, but harder to do under stress is getting the hits. The hunter doesn’t simply shoot at the animal’s body; he strikes at the vitals. I submit that we must do the same thing, but have very compressed time frames in which to do it! Some say this is not possible and is an unrealistic expectation. I say “it is what it is” and that placement is power. There are torso hits and there are good torso hits. A bullet through but a lung gives the aggressor a case of walking pneumonia and is not a sure stopper unless he is devastated mentally. I doubt that any of us want to count on that. A bullet that cuts the aorta or pierces the heart is quite something else. It may not instantly stop him, but the clock is ticking and his conscious time will usually be measured in seconds rather than minutes. Pick the load/caliber/handgun you want, but without the ability to place your shots at speed, do not expect it to “stop” quickly. Even if you can make quick, accurate shots do not place too much faith in your gun, caliber, or load. You can do everything right and still not instantly stop your attacker. The handgun simply doesn’t have enough power. We use them because they are convenient and able to be with us when attack is not expected. Firearm trainers have indicated that the long arm is much to be preferred to the handgun for defense. They’re not speaking only with regard to the ease of accuracy, but to the increase in power. Unless the brain or central nervous system’s damaged, we need the rifle to do what we expect the pistol to. Select a handgun in at least .38 Special or 9mm and base that selection on reliability and how well you personally shoot that weapon, be it revolver or semiauto. Use one that you are comfortable with. It doesn’t matter if it’s double-action S&W or a Browning single-action automatic. What matters is if you can get the hits with it and are comfortable using it. Learn what you can from serious researchers in bullet performance and make your decision on a carry load, but be sure that it is reliable in your handgun. The “practice” part is too often neglected. Having the “best” gun and ammo is not nearly all of the solution. Competence with it is essential. Practice routinely and if necessary get training. 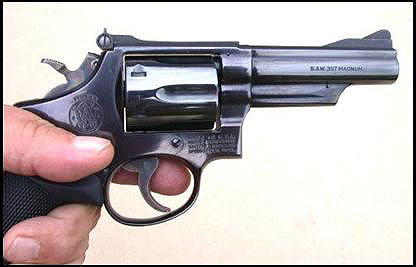 If what works for you is a double-action revolver, go for it. If you shoot .38’s better than .357’s, use that caliber. Hits count. Don’t be as concerned with having “only” six shots vs. 8 or more. I think we run out of time before ammunition. 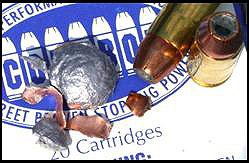 A good hit or two with the .38 is better than a poor hit or miss with a .45 or .357 SIG, etc. If you shoot a forty-five as well as a 9mm, go with the former, but do not expect it to be vastly superior to the nine. With equivalent hits, I doubt that much if any difference will be seen. If one does better with the 9mm, I’d cast my lot with it. Once you have a caliber capable of adequate penetration and expansion, placement is power.